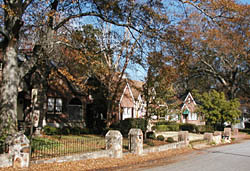 The Garden Hills Historic District is an early 20th-century planned residential neighborhood located five miles north of the central business district of Atlanta. The roots of this planned community came from the growing use of private automobiles after WWI, allowing citizens to live further away from where they worked. In addition to single-family residences, the district also includes apartment buildings, a church, a historic commercial area, two schools and businesses that lead to a fairly self-contained community. The original plan for the neighborhood was developed by the Garden Hills Company, a real estate firm founded in 1925 by Philip C. McDuffie, a lawyer and real estate entrepreneur. A natural ravine divides the original plat from a similar development created at the same time as the original Garden Hills section. Slated to be called the Beverly Hills Subdivision, this development merged with Garden Hills. It includes land used for two of the neighborhood's institutional landmarks: North Fulton High School and Garden Hills Elementary School. By 1926, the area of development had been expanded considerably and consisted of three sections stretching from Peachtree Road to Piedmont Road. These three sections, which comprise the historic district, are the original Peachtree Road section, a centrally located Country Club section, and the Brentwood section. Garden Hills has consistently been a stable, upper-income residential neighborhood of single-family homes with a mix of compatibly scaled apartments. Houses within the interior of the district are typically set back approximately 20 feet on lot sizes of 70 by 80 feet. Corner lots are somewhat larger. The houses are one- or two-story brick veneer or frame dwellings. The predominant architectural styles include Tudor and Colonial Revival styles. Most are of a very high degree of craftsmanship, reflecting the upper-middle income families for whom the original development was intended. Garden Hills Historic District is located in NE Atlanta, and is roughly bounded by Delmont, Brentwood, and N. Hills drs., Piedmont, E. Wesley and Peachtree rds. The houses in the district are private residences and are not open to the public.